Cape Town - Nearly a week into their winter training camp in South Africa , with two friendlies and plenty of hard practice under their belts already, VfB Stuttgart's players and staff temporarily switched the focus away from football on Sunday afternoon to pay a visit to Robben Island. After morning training and a bite to eat, the team made the 25-minute crossing to the island prison where Nelson Mandela was held for 27 years. This was one outing that would certainly leave a lasting impression. Christian Gentner and Co. were shown the mines where inmates once carried out forced labour, passed a graveyard for sufferers of leprosy and viewed a church, upon whose spire a blue or pink flag would be hoisted to announce the birth of a boy or girl, before going on to take in the island prison. The tour guide was former inmate Dumi Sami. “It was incredibly interesting and very thought-provoking to have a genuine former inmate lead the tour,” said the VfB captain: "When you see the prison cells and hear the stories, it really does make you reflect on things. It's simply unbelievable to see the conditions the inmates were kept in here." Sami also showed the Bundesliga stars the field “that was our Ellis-Park Stadium - on Saturdays almost all of the inmates could be found here, either playing or just watching the football games.” Antonio Rüdiger was eager to know if Nelson Mandela had played football himself there, but as Sami explained, the recently deceased former South African president was more actively interested in boxing. In fact, he was not even permitted access to the pitch area and confined in a separate section of the prison. 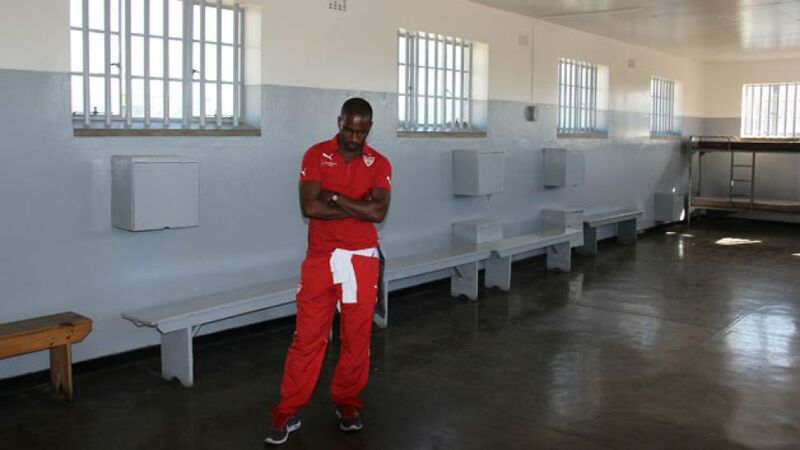 The players visited the cell where Mandela had been held in solitary confinement and a silence descended in a moment of remembrance for those who served time and lost their lives on Robben Island: "The whole thing's made a real impression on me. It's very sad to hear what went on there, and amazing that someone can be there for so long and then just leave and forgive,” head coach Thomas Schneider noted afterwards, adding: "It was an important experience to have been at this historical location with the whole team."